Fractions may be challenging, but they can be fun, too! 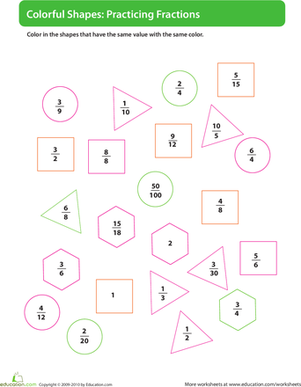 In this worksheet, your child must color in the fractions according to their value, giving all of the fractions that are equal to each other the same color. Simple fractions worksheet helps teach your child to reduce fractions to their simplest form and cartoon characters keep learning interesting. As kids practice division facts to 100, they will strengthen their foundation for valuable skills, such as long division and problem solving. The area model visual allows children to see the layers of computation within a multi-digit multiplication problem. Help your child develop their place value superpower with this practice sheet! This worksheet will help your student practice breaking down big numbers into expanded form using place value, from the ones place to the hundred thousandths place. Students will use the partial quotients strategy as they work through this problem set. Does your child know that 1/2 is the same as 2/4 and 3/6? 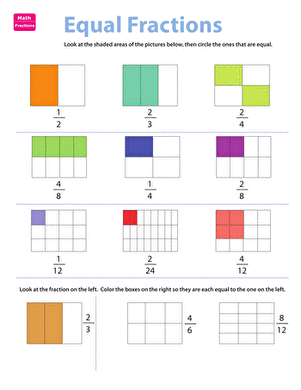 Kids practice identifying equivalent fractions on this colorful worksheet. Here's a review to help your child master converting fractions to decimals and vice versa. 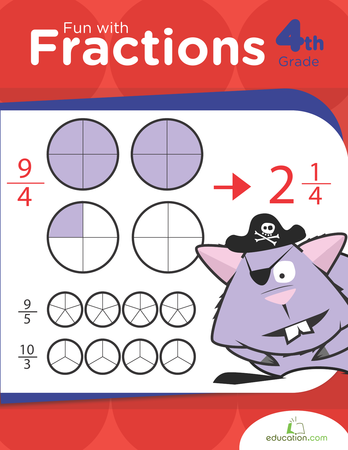 Packed with fraction addition and subtraction problems, this worksheet is sure to provide the extra practice your child needs.